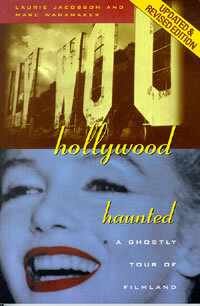 Hollywood’s citizenry has always leaned toward the dramatic and the sensational, and its ghosts are no exception. The history of Hollywood unfolds as Laurie takes you into the oldest studios and hotels, the most glamorous theaters and nightspots, and beautiful homes from Beverly Hills to Hollywood. Hear about the ghosts of mobsters, lovers and bandits. Learn about the celebrities who have seen ghosts, celebrities who have lived with ghosts and celebrities who are ghosts! These spine-tingling, true ghost stories include movie stars, love affairs, murder mysteries, rare photographs, celebrity interviews and a good dash of humor. Sharon Tate and Paul Bern, Ozzie Nelson, Lucy, Madonna, Bela Lugosi and Hollywood & Vine, Lon Chaney and Universal Studios, Howard Hughes and the Pantages Theater, Marilyn, Monty Clift and the Roosevelt Hotel, the headless ghost of Beverly Glen, Ciro’s and the Comedy Store and more.